I was a guest at Gili Lankanfushi on a full board basis. This, and all my reviews, are always honest and my own. Staying at Gili Lankanfushi was a long term item on my bucket list so I was incredibly excited to finally make it a reality and now share my experience with you in this review of Gili Lankanfushi, the best resort in the Maldives (as chosen by TripAdvisor). If you search on Booking.com you will notice that there are 196 five star hotels and resorts in the Maldives. This is probably the highest concentration of luxury hotels anywhere in the world. It should come as no surprise that discerning between the best luxury resorts in the Maldives and the good is a really difficult job, especially if you are doing it based on online research. All resorts look stunning, the Maldives waters are beautiful no matter where you look and on paper, you can’t really tell what sets each apart. So why did I think Gili Lankanfushi was at the top of my wishlist for luxury resorts in the Maldives? Because of recommendations from (highly demanding) friends, because it has been awarded several recognitions such as being chosen Best Resort in the Maldives on TripAdvisor twice or Best Destination Spa by Conde Nast Johansens Awards for Excellence in 2018. But above all, because it had most of the elements that I care about from a luxury resort. If you are wondering what those are, read my review of Gili Lankanfushi below to find out why I thought it was one of the best resorts in the country before and after staying there. Gili Lankanfushi is owned by Singapore-based HPL Hotels & Resort, a hospitality management group with 11 hotels and resorts across Asia which I am very familiar with and a fan of. I have previously stayed at Casa del Mar in Langkawi and at The Boathouse Phuket, both of which, while being very different types of hotels, shared the same commitment to service and long term employee satisfaction. Gili Lankanfushi was no different. Many of the staff I talked to had been with the resort for years, despite the very competitive Maldivian market where dozens of luxury hotels open every year and try to poach the best staff from awarded resorts like Gili (Gili’s previous General Manager is now the area head for Joali Maldives). Gili Lankanfushi used to be part of the Soneva Group, who sold the property to HPL Hotels & Resorts in 2012. Instead of completely changing the property, most of the successful elements were maintained including the brand’s commitment to sustainability and much of the same look & feel as well as service standards. If you have visited or are familiar with the Six Senses brand (I have stayed at several Six Senses including Zighy Bay in Oman, Six Senses Con Dao in Vietnam, Six Senses Singapore in Duxton, and Six Senses Qing Cheng Mountain near Chengdu) or with Soneva (I have been to Soneva Fushi in the Maldives and Soneva Kiri in Thailand), you will feel very much at home. The same “No news, No Shoes” barefoot philosophy, the use of sustainable materials for the resort’s construction, the Mr/Ms Friday personal butlers and even the pastel yellow, green, orange colors are present throughout the resort. But, slowly, Gili Lankanfushi is starting to claim its own identity, personalising some of the elements like the color palette, to make them unique to the resort and set them apart from former group brands. What the resort still preserves and will continue to strengthen, is its eco-friendly approach and the commitment to sustainability. Marine conservation efforts, the banning of all plastic and the use of eco-friendly amenities and products are all part of the brand’s values. 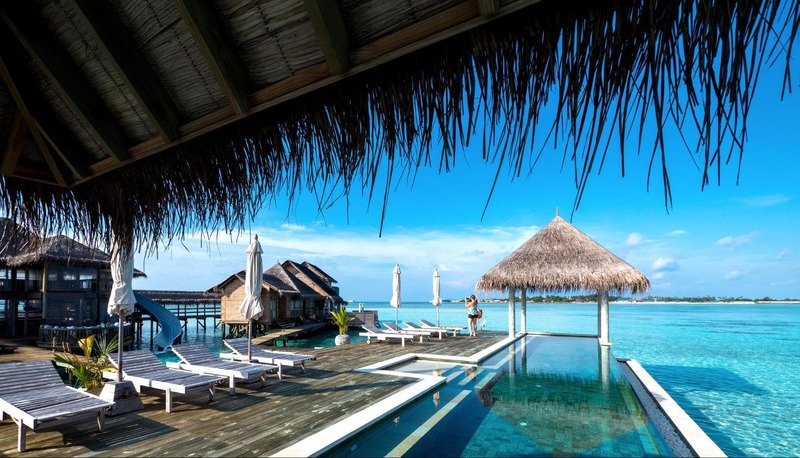 Gili Lankanfushi is one of the few truly luxury resorts in the Maldives that are near Male Airport. This means that to get there, you do not have to take a seaplane but rather a 20-30 minute boat ride, depending on the weather. I was coming to Gili from an overnight stay in Hulhumale and arrived at the airport at noon to meet the representative from Gili at the arrivals area where all the resort counters are. I was meeting a friend who was landing from an international flight so I waited at the airport’s general waiting area. Because Gili sends a speedboat for pretty much every arrival, guests don’t have to wait around and so the resort does not have its own airport lounge. As soon as my friend arrived, we walked straight out of the airport terminal and onto the speedboat which was parked right in front of the arrivals area. The walk was no more than a few hundred meters. Gili Lankanfushi has its own fleet of luxury speedboats to pick up and drop off guests, making the transfers as efficient as possible when they land in the Maldives. It is possible to step on the resort in less than an hour from landing, a far cry from the resorts that are reachable only by domestic flight or seaplane. On the boat, decked with emerald green cushions, we were introduced to the crew, given life vests, a cold lemongrass-scented towel and a cute small coconut to accompany us on our short journey to the resort. Our shoes were also collected and stored in the canvas bag, where they would remain for the rest of our stay. The speedboat journey length depends on the weather and how strong the waves are but takes a maximum of 30 minutes. As we approached the resort we immediately recognised its standalone water villas and jetties. Gili Lankanfushi is not set far away from other islands and, in fact, one of the local islands is very near and can be seen on the horizon. Its proximity to Male also means that you can see some of the local boats outside the lagoon. If you want to feel like there is nothing around you, the villas facing the sunrise see almost no traffic. As soon as we stepped onto the main arrivals jetty we were greeted by our Mr Friday, Aboo, who was in charge of making sure all our strange requests would be taken care of. Aboo escorted us to the room on a buggy while giving us a tour of the island. Our luggage was taken straight to the room where we completed our check-in formalities. Even the credit card given as guarantee was swiped directly on a portable reader in-room. We had a chilled welcome bottle of champagne and bottle of homemade iced tea as well as a wide selection of canapes that were designed as a small meal, with a starter, main and dessert all neatly and prettily laid out on top of the cupboard in the bedroom. 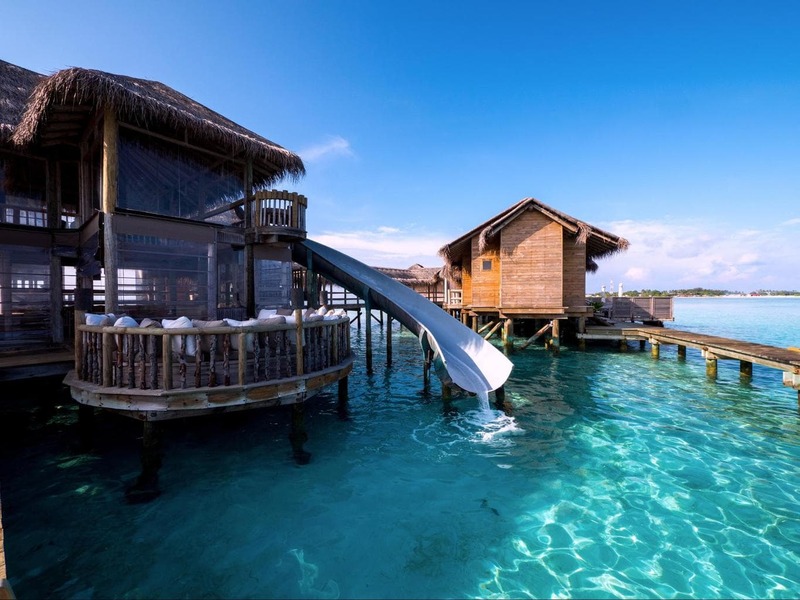 Gili Lankanfushi is an all-water villa resort and has different kinds of villas spread across three jetties plus a few standalone Crusoe Villas that are not connected to the main island and offer the full castaway experience. It also has the largest standalone overwater villa in the world, the five bedroom Private Reserve. With the many overwater villas in Asia, that’s quite a feat. All villas at Gili are built on planks, with eco-friendly materials and have thatched roofs and open plan spaces with lots of light. They epitomise the concept of barefoot luxury like no other, bar Soneva and Six Senses. Let’s look at each type of villa at Gili Lankanfushi separately. The entry level rooms, if we can call them that, are the 210 sq meter Villa Suites. There are 24 of them, spread across two of the jetties. These are spacious, rustic chic over water villas with large bedrooms and bathrooms and a second floor with a sunlounger and a table. The villas have two units on each side and a middle, open-space, living room area with a lower level terrace filled with two sunbeds, an umbrella, a daybed, a table and two catamaran nets with cushions. You are so close to the clear and calm water that you can see marine life swimming by, and we did. During our stay, we spotted baby sharks, turtles, manta rays, lots of fish and a spotted eagle ray enjoying the peacefulness of the lagoon. The bathroom in the Gili Lagoon Villas is huge and has an outdoor separate shower surrounded by an enclosure of the lagoon, a bathtub attached to the window and his-and-hers sinks. There is also an open closet area to hang or store clothes. The living room area is open although you can bring down the blinds should the rain and wind become too much, and has two sofas, a table with chairs and a couple of board game tables. There is also a cupboard where the minibar is located and which is topped by a hidden Nespresso machine and any other glassware you may need. The bedroom is air-conditioned, spacious and has floor-to-ceiling glass windows, a sofa and a large desk with the best office views in the world. The king bed is draped by a mosquito net and has the softest bed sheets. The cupboard below the hidden TV holds the sound system and a few other electronics. Needless to say, I only realised there was a TV when the topic came up in a conversation with the Marketing Director, I had completely missed it hidden behind a blood orange curtain and would never turn it on. The upper level daybed can be transformed into a regular bed so you can sleep under the stars. This is also a great spot for an in-villa breakfast. The next level up in the villa category are the Gili Lagoon Villas which are located along the third jetty and are a category up because they face the sunset and have their own private hammocks. That part of the lagoon is also nicer and has a deeper blue. After the lagoon villas come the Residence Villas. There are only six of those located at the end of the two jetties facing sunrise and measuring 250 sq meters. These villas differ from the rest in that the living room space is enclosed and can be converted into another bedroom. These are the preferred villas for families of four who can comfortably fit. The enclosed living room also has air conditioning for those who get too hot in the Maldives. While the lack of AC in the suite villas is not a problem for me, it may be for those who are less used to the heat. Residence Villas also have their own kitchenette and wine chiller to stock your favorite bottles but not a hammock. There is one Lagoon Residence Villa which comes with its own hammock and sunset views. The Crusoe Residences are the seven standalone water villas located on a crescent off the tip of Palm Beach. These are an iconic type of villa only found at Gili Lankanfushi. These villas are on their own and not connected to the island other than via a small wooden boat which guests can have at their disposal if they feel comfortable using them. Alternatively, they can also just call their Mr Friday for a pick up or drop off. While they are similar to the Residence Villas inside, they have their own private hammocks in front of the villa and the isolation and privacy that not being connected to the island provides. They also face the sunset so can indulge in great views. For families, the Family Villa is located at the end of the sunset facing jetty and comes with two bedrooms, its own private gym, jacuzzi and the proximity to the nearby Three Palm Island to relax and escape. It measures 350 sq meters. The family villa has two living rooms, one of which can be converted into a second bedroom, and a large master bedroom with its own bathroom including an outdoor jacuzzi. The second floor of the villa has another jacuzzi. A villa of this size is thought of with families in mind and has its own kitchenette, wine chiller as well as steam room. It also has exclusive access to Three Palm Beach nearby. The top of the range accommodation option at Gili Lankanfushi and, arguably the Maldives, is the 1,700 sq meters two-storey Private Reserve, a standalone five bedroom villa located 500m from the island and only accessible by boat. It is the largest water villa in the world. Described as a “fort of dreams”, this is the ultimate seclusion and privacy for a group of friends, a wedding, a large family or a wealthy individual. Rumour has it that someone lived there for three years! The Private Reserve has its own gym, spa, cinema room, an infinity pool perched over the ocean, two sea hammocks, a swinging sofa and a slide to keep the whole family entertained. Some of the bathrooms have outdoor jacuzzi tubs and their own outdoor spaces. It is hard to imagine what it must feel like to stay in such a glorious accommodation. But I can tell you, since I got to spend a day there, that it felt like we were completely alone, miles away from civilisation when in fact the ride back to the resort was only five minutes. The look and feel of the villas at Gili Lankanfushi is reminiscent of both Six Senses Laamu and Soneva Fushi since the resort used to be part of the former Soneva-Six Senses group and the decor and much of its spirit and unique selling proposition has been maintained. You will find orange and yellow cushions and color splashes, the same rustic aged wood, the back-to-basics level of luxury and the attention to detail and service. The theme here is understated luxury with lots of details that make your stay special but without any of the superfluous elements that are unnecessary in the Maldives. Food and dining experiences Gili’s strongest points, not only because of the quality of the food but also because of the various food and wine experiences available and the opportunities to tailor-make your own food journey to your preferences and liking. There are three restaurants at Gili Lankanfushi. The Overwater Bar serving all day dining with a lunch salad buffet with two daily specials and an extensive Mediterranean and Indian Ocean inspired menu. While the buffet is only available at lunchtime, the rest of the menu can be ordered all day. Portions are huge here and we struggled to finish any of the dishes. You can order from a pretty vast array of options from casual meals like burgers and sandwiches to more elaborate dishes like curry. Asian influences are clear. The drinks menu is also very long, with a series of signature cocktails and drinks from the bartender. The restaurant area is covered and it also has a jetty with a platform where you can enjoy the best sunsets. Here, you can don your swimming gear during the day and laze on the few sunbeds. The bar area has a few high stools and a sunken round area with glass bottom and sofas in case you prefer your drink with a side of marine life views. The sandy Kashiveli restaurant opens for breakfast and dinner and is located beach side with some outdoor tables under the shaded palm trees and other under a thatched roof. At breakfast, the spread is magical and has a live fresh fruit station where you can get any fruit cut to order, several types of cereals, pastries, nuts and seeds and a large selection of Ayurveda concoctions. There are also some Maldivian dishes on display and other options like porridge. The star of the breakfast indulgence is the a la carte menu from where you can order a variety of hot dishes, freshly squeezed juices (the list is endless), and pretty much anything you can think of. They have a very good healthy menu with lots of options and also local Maldivian alternatives. For dinner, Kashiveli has ongoing nights where specific cuisines or themes are on offer and where you can sample island specials, Arabian Delights, Asian specialties, etc. We indulged in colorful freshly handmade pasta, roasted chicken, the freshest ceviches, fantastic Asian dishes, etc. The food at Kashiveli was not your typical buffet experience but actually something to look forward to and every dish was prepared to perfection and with a lot of attention to detail. The fine dining Japanese restaurant By the Sea is where you can enjoy a more refined experience, although still barefoot and casually dressed. There are three spaces to indulge in the freshest produce, a sushi bar, a teppanyaki counter, and a few sunken sofas with sea views and a fusion Japanese menu. Food at By the Sea is more elaborate and premium and best paired with some of the amazing sake bottles on the list. The food here is meticulously presented in the prettiest compositions and prepared with a lot of attention to detail. For those who love ice cream, there is also an ice cream shop by the pool called Fini Foni where you can order handmade ice cream flavors. One of the resorts showstoppers is its underground cellar. Gili is not the only luxury resort in the Maldives with one, I first experienced this extravaganza at the Conrad Rangali, but it does have a great cave with a cold room filled with a selection of cheeses and cold cuts and a chocolate room with lots of different hand made chocolates. Other resorts in the Maldives like, for example, LUX* South Ari Atoll, have a wider range of restaurants, but Gili prefers to focus on personalised dining experiences instead. These can be designed from one of the many options available or you can even come up with your own. You can have dinner at 360 Table above the garden, on a secluded patch of beach surrounded by lanterns and under the stars, in your villa, in the middle of the organic garden, in the cellar with a sommelier-hosted, wine pairing, indulgent dinner, or even on a floating platform on the lagoon. There are private barbecues on One Palm Island or picnics on the sandbank and you can even enjoy your private dinner and movie at the Jungle Cinema. If you can think it, it can be done by the great food and beverage team. Other dining experiences include chocolate and wine pairings, cheese and wine pairing or the fabulous Gili Tasting Journey which includes five drinks with canapes at five spots in the resort as you take in the sunset (ideal on your first night so you can see all the various dining spots available). This was a great experience and, as we made our way through the resort by the hands of some of its best food and beverage managers, we discovered all the hidden destination dining locations while sipping on the best drinks with fantastic small bites. We started with champagne and ice cream by the beach and ended with Gili’s signature drink made with pink dragon fruit. I enjoyed Gili’s approach to dining as it was different and unique and meant that every meal was an event and an opportunity to celebrate, akin to what a real holiday should look like for food lovers. Gili definitely takes dining to a whole new level. Gili is located on the island of the same name. I found the size of the island to be perfect for everything to be near enough without feeling too small. You get your own set of bamboo bikes to get around or you can call Mr Friday to come get you on the buggy. Walking is also possible. It is unlikely that you will spend much time at the common areas of the resort simply because your villa is so spacious and divine that leaving it is a challenge. But if you do, you can peruse some of the resort’s facilities like the shared pool, right on the beach. Gili Lankanfushi villas do not have their own pools, with the exception of the Private Reserve, so if you need a fix of fresh water, the pool might be the right place. Otherwise, the lagoon is shallow and inviting so it might just be enough. It is precisely the lagoon where you will find Gili’s main facility. It is one of the largest lagoons in the Maldives and serves as the resort’s playground. You can read the next section with information about all the activities you can do there. Gili also has its own organic garden, set in the middle of the island, where a lot of the herbs and greens you will be eating are grown. Those with a need for exercise, the gym has nice views over the jungle and there is also a surf shack to book surf lessons and a marine center to learn more about aquatic life. Yoga lessons can be enjoyed at the yoga champa and the in-house tennis coach is ready to challenge you. If it rains, you can always enjoy a game of pool or duck into the Meera Spa which has its own separate overwater cabanas. The Library has some books you can borrow during your stay. One of the most romantic facilities at Gili Lankanfushi is the Jungle Cinema where movies are shown on some nights. You can sit back on a comfy chair, toes in the sand with the background sounds of the jungle and watch some classic movies. The resort’s marine shack is not only a place to come to for excursions but also a learning and research center where talks are given and you can learn more about the local marine life. Gili’s research efforts, especially into coral growth and restoration following the 2016 coral bleaching event, are encouraging and guests can adopt a coral line and receive follow up information with details on how their line grows from the moment it is planted at the resort’s line until it is moved to its final location. Repeat guests can also go visit their line. Gili is quite an active resort if you want it to be. The lagoon gives you the chance to enjoy lots of water sports in the peace and quiet and the outer reefs and the proximity to lots of dive sites and surfing spots add an extra layer of action. All the usual suspects are available. You can borrow stand-up paddleboards, kayaks to paddle to One Palm Island or the few hammocks in the ocean. You can snorkel right from your outdoor verandah and look for the friendly marine life. You will surely find baby reef sharks, octopuses or rays or you can just cycle around the island on your bamboo bikes. If you don’t dive but came to the Maldives for the great snorkeling the island provides, the lagoon may not be enough but a short boat ride will drop you at the outer reef where you can snorkel to your heart’s content and find some of the larger marine animals. For those who prefer speed, you can rent or book catamaran sailing lessons, go fishing or even windsurfing, wakeboarding or water skiing. While most visitors to the Maldives come for the crystal waters and the dreamy beaches, there is a world of local culture to explore so you can also embark on excursions to nearby islands, maybe even Male. More common excursions include sunset dolphin cruises to look for the local spinner dolphins, a really nice experience in the Maldives as they seem to be found everywhere. Or just a sunrise/sunset cruise with a loved one. If you want to see what it’s like to fly above the Maldives, you can also book a sightseeing seaplane ride. I really love seeing the Maldives from the sky and Gili’s convenient location near the airport means you miss out on that. Those like me who consider food and wine as important as sightseeing will appreciate the opportunity to book a cooking class where you can learn some of the local dishes like the coconut curries. If you are lucky and a good cook, you can eat your own meal. The resort’s Meera Spa offers great treatments right over the water and has visiting specialists and experts that provide additional treatment options. Yoga and meditation are offered complimentary every day. 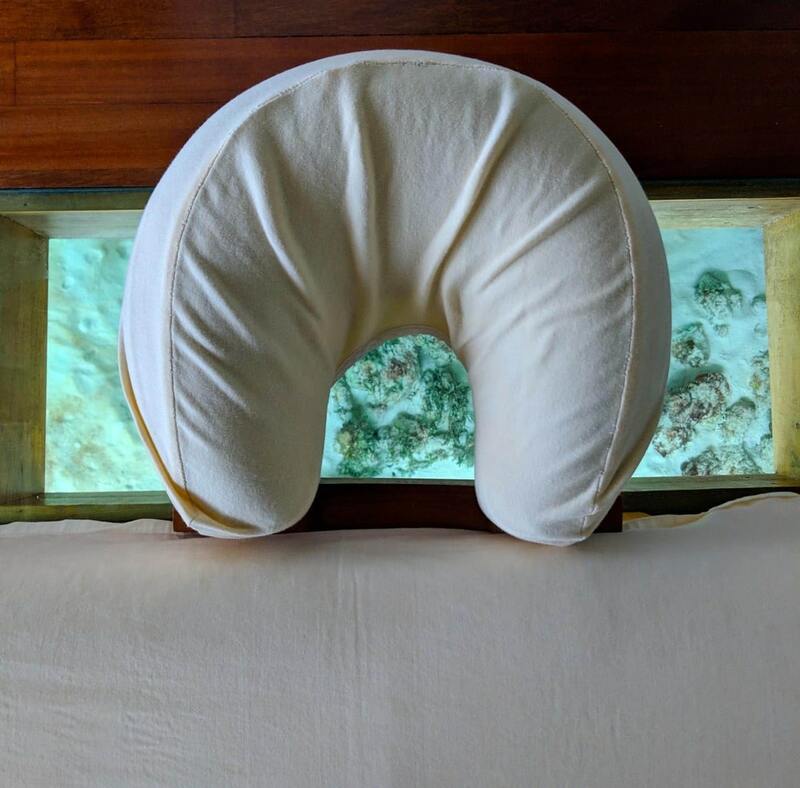 As you relax in your treatment, you can also look down through the glass bottom to see the fish swimming by, or even a baby shark like we did. I found the team at the spa very skilled and the massage lovely. Before or after, you can relax in the upper floor with views over the horizon and endless ocean. The Maldives has a host of incredible resorts to stay at and several of the luxury resorts offer personal butlers. You will find them at Soneva Fushi, at Six Senses Laamu, at Milaidhoo, at the St. Regis Vommuli Island or at the Conrad Rangali among many other. From experience, not all butlers are made equal and while some are there to help but cannot take the initiative to pre-empt your needs, others are able to go several steps further and know what you need even before you do. I found the service at Gili Lankanfushi and our butler to be of exceptional level. He was ready to help us with whatever requirement we had and was always prompt and, as the Marketing Director put it, “cool as a cucumber”. I was sure he had dealt with far more difficult people than us. Perhaps what sets the butlers at Gili apart from the good service everywhere else is the can-do attitude and the sense that no matter what you ask for, no matter your wishes, everything is possible. If you can think it, Mr/Ms Friday can make it happen. The feeling that nothing is too troublesome is something that is quite unique of the Maldives and not found at other honeymoon destinations like Bora Bora. When I compare both, the level of personalised service is something with which the Maldives stands out. But even there, not all the luxury Maldivian resorts excel at it as well as Gili does. This is one of the real pioneering resorts in the concept of personal butlers and it shows. Gili Lankanfushi is a fabulous resort but, as with all luxury resorts everywhere in the world, it is not the best option for everyone. Stay here if you are looking for romance and enjoy the type of understated luxury that the resort values and promotes. If you like to wear high heels, dress up and be surrounded by modern facilities, this may not be your cup of tea. Gili offers one of the best holidays for couples. Stay at Gili if your definition of a vacation features food and wine as much as it features relaxation, keeping active and learning something new. Do not stay here if food does not matter much to you as you would miss out on one of the best differentiating factors the resort has to offer and there are other resorts with a wider range of dining restaurants and buffets. Book a solo trip to Gili if you are looking for some me time with yourself, want to enjoy the Maldives in luxury and are afraid of being alone in a resort that is mostly for families and couples. Gili has a Solo Package designed with travelers who come without a plus 1 and which includes a variety of activities geared towards the individual traveler like a photo session with your Mr/Ms Friday, a barbecue in the sandbank, a dinner in the dark and plenty of pampering. Book at Gili if you escape to the Maldives a few times a year in search of luxury and don’t want to waste time in airport transfer by seaplane. But don’t come if you want to feel remote and far away from everything. At Gili you will be able to see the local island nearby and hear the occasional plane fly above. Despite having terrible weather for the duration of our stay, I cannot fault the resort on anything. Even in bad weather, when most of the water activities and outdoor experiences were not available, we stayed pretty occupied with all the indoor options and the absolutely fantastic food experiences. Gili Lankanfushi does Crusoe-style, rustic chic for two like no other and the all-overwater villa concept with the famous Crusoe Residences is an irresistible offer. The convenience of its location cannot be missed either. A good friend of mine living in Dubai always tells me that she comes to the Maldives several times a year for a long weekend and always looks for hotels near the airport. I did not understand what her obsession with convenience was until my stay at Gili. Don’t get me wrong, I love a good seaplane ride, but the transfers easily add another 2-3 hours each way and can mean you spend a really long time waiting at the airport if your return flight is late at night. At Gili, you make the most of your time in the Maldives. For couples looking for romance, I cannot think of a better vacation destination, Gili does romance to perfection. Last but not least, value for money is something which matters to me the most. There are luxury resorts and hotels everywhere in the world but the final verdict depends on the price level they come at and whether it is worth the splurge. Gili is not an affordable resort. Rates in high season can cross the $2,000 a night mark just for bed and breakfast and you can expect to spend another $500 a day on food and activities at least and much more if you start adding dining experiences, paid activities, etc. When compared to other resorts of similar luxury level, I found Gili Lankanfushi to be priced adequately to the competition with several advantages in quality and range of dining options (especially the unique ones), fantastic service and a great list of activities available. Gili Lankanfushi is definitely one of the best luxury resorts in the Maldives, without a doubt in the top-5, perhaps even the number 1, but I would have to visit them all to make that claim!